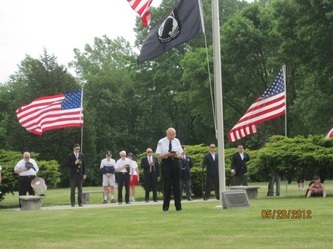 Without your help the 2012 Independence Day Parade, as well as other events, would not have been a success! 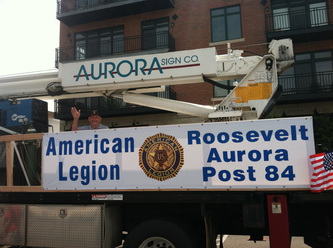 Thanks to all who attended the parade, and thanks to Aurora Sign Co. for allowing us to use their truck. We had a lot of fun and are looking for the next chance to be a part of the events in Aurora. 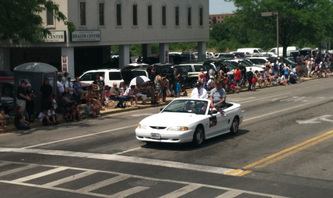 Congratulations Warren "Red" Dixon Sr. 2012 Grand Marshall!! 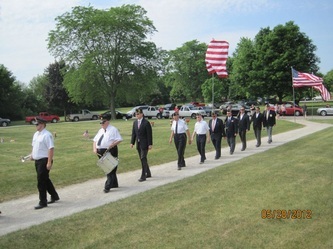 The 2012 Independence Day Parade! Now is your chance to be in the parade, or help us to provide a wonderful parade experience by donating to the event. Click the 'Donate' button below and help us as a Sponsor of the event! To volunteer to help with the parade, please contact Sanura Young at SYoung@aurora-il.org. AURORA — Longtime Aurora businessman and Navy veteran Warren “Red” Dixon Sr. will serve as grand marshal of Aurora’s Independence Day Parade. A 96-year-old World War II veteran, Dixon remains active with veterans programs including Honor Flight Chicago and the Fox Valley Veterans Breakfast Club. 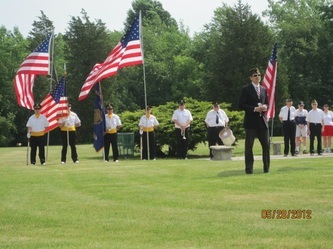 He will be at the head of the Fourth of July Parade as it steps off at 10 a.m. in downtown Aurora. Dixon has a long biography of involvement and contributions to the community. 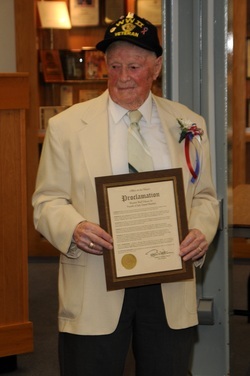 He moved to Aurora when he was 8-years-old and graduated from East Aurora High School in 1934. Dixon started Dixon Realty on Lake Street in Aurora in the 1960s and eventually moved his business to Farnsworth Avenue, helping develop the Molitor Road intersection by building Daisy’s Flower and Gifts. He is the past president of the Aurora Board of Realtors and led the group to plant numerous trees along Lake Street and New York Street. Dixon has also been involved with the Catholic Charities Foster Children, Light the Night, the Aurora Chamber of Commerce, Elks Club, Knights of Columbus, the Moose and is an honorary member of the Tiger Club. He also started the youth football program at Annunciation Church and volunteered as a coach in the Aurora/Naperville area for more than 30 years. 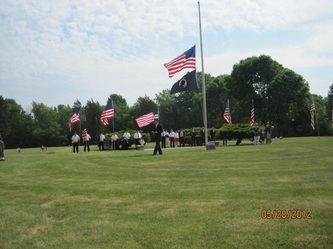 Dixon was married to his wife, Daisy, for 67 years, and the couple had two children, five grandchildren and six great-grandchildren with another expected this summer. He also just passed his driving test. Dixon will be honored by the city at Tuesday’s City Council meeting, beginning at 6 p.m. at City Hall. Independence Day in Aurora will begin with a patriotic ceremony at 9:15 a.m. outside the Paramount Theatre, 23 E. Galena Blvd. The parade will step off at 10 a.m. from Benton and River streets. The July 4th fireworks festivities will start at 5 p.m. on the grounds of the Illinois Math & Science Academy, 1500 Sullivan Road. The event is sponsored by the city of Aurora and the village of North Aurora along with support from Aurora Central Catholic High School, the Fox Valley Park District and IMSA. The entertainment stage sponsor is HR Green. Entertainment will include free inflatables and rides for children 12 and under; local food vendors; bands; Aurora Historical Society activities and games. The fireworks are scheduled to begin at 9:30 p.m. The American Legion Post 84 and the city are still seeking volunteers to help with the parade. 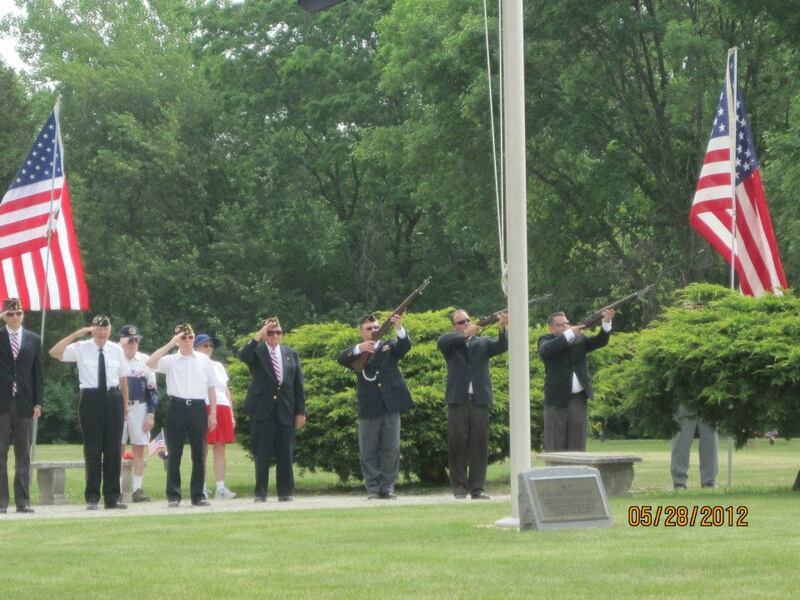 Anyone interested in volunteering is asked to contact the City’s Community Services Department at 630-256-3400.